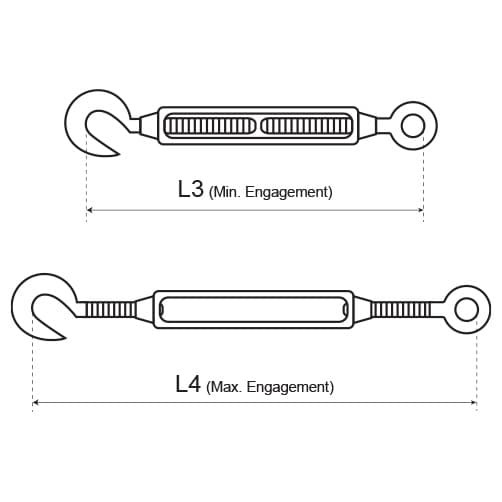 Traditional style open body turnbuckle with threaded hook at one end, threaded eye at the other end, manufactured from A4-AISI marine grade stainless steel. 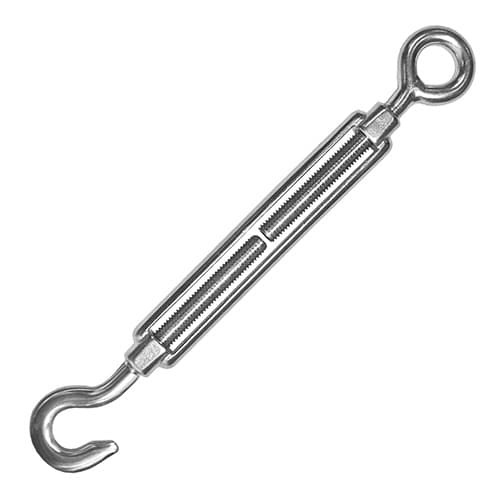 Traditional style hook/eye open body turnbuckle. An affordable range of hook to eye wire rope tensioners ideal for landscaping and horticulture and also installations such as catenary cables, rigging and fencing. 316 Marine Grade Stainless Steel - highly corrosion resistant. Quality manufactured for strength and value. We recommend starting with your turnbuckle half engaged, this is so you can apply tension once fitted. Rotate the central strainer body by hand to release the threaded eye and hook ends. 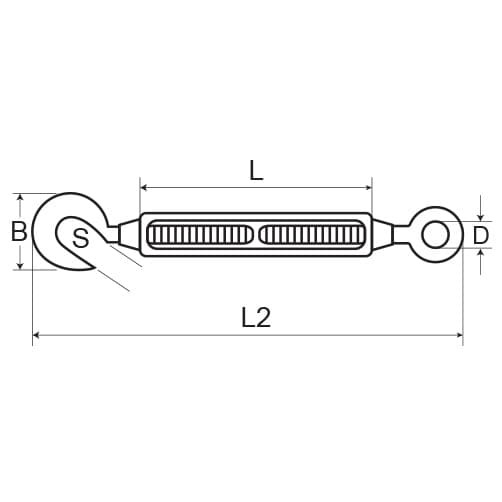 Once your turnbuckle connected, simply tighten the turnbuckle by rotating the central strainer body until the required tension is achieved. Tip: You can use a flat head screw driver or the claw of a hammer to help tighten the central strainer (dependent on turnbuckle size). Important: If using with wire rope, it is important that the wire is NOT allowed to turn or twist as this could weaken the wire. Great kit! No hesitation in reordering if I need to. Good quality. Quick delivery, have always had good service from S3i. I have purchased this product once before and was confident when I made a new order that both service and product would be excellent.will probably back for more in the next few weeks. These are excellent and work really well to tension the wire. Good quality and easy to use. Prices was competitive. Marine grade stainless steel...should last well in the garden. The product is excellent quality and exactly as described. Great. Looks tidy and does the job. Used for garden trellis wires. Work well. Nice quality product. Love it. This is an excellent top quality, easy to use product. It is highly weather resistant and remains easy to adjust over time. The material is extremely fit for purpose. As described. Did the job. spot on for what I needed them for. but did find the threads a bit tight on one of the units. I used this to tension wire along a fence in my garden and it did the job just fine. Seems to do the job and is sturdy. Very easy to install and use. Does a great job. Stainless Steel Wire Rope, flexible 7x19 construction. Stainless steel Eye Bolts - woodscrew thread. Stainless steel Wire Rope Grips.